Data never lie, if you look at them objectively. I've seen MASSIVE (!!) folly in the fields of economics and demography (and many others) that could have been easily avoided by some broad, high level analysis, to set the context. In climate science a couple of broad analyses can avoid much folly. I've covered these elsewhere, but now I'm able to make a firm analysis (in the ballpark) about the actual effect of man's CO2 emissions on global warming. The analysis below shows that the MAXIMUM that humans have contributed to global warming in the 20th century is 0.15 degrees Celsius. I'm willing to wager (based on other analyses, provided elsewhere) that the MAXIMUM effect of human CO2 emissions – if continued at the current rate) in the 21st century will not exceed 0.5 degrees celsius. True, I won't get the benefit of winning the wager since I won't be around in 2100. But this is a ROCK SOLID FIRM prediction based on broad analyses, and will not go wrong. 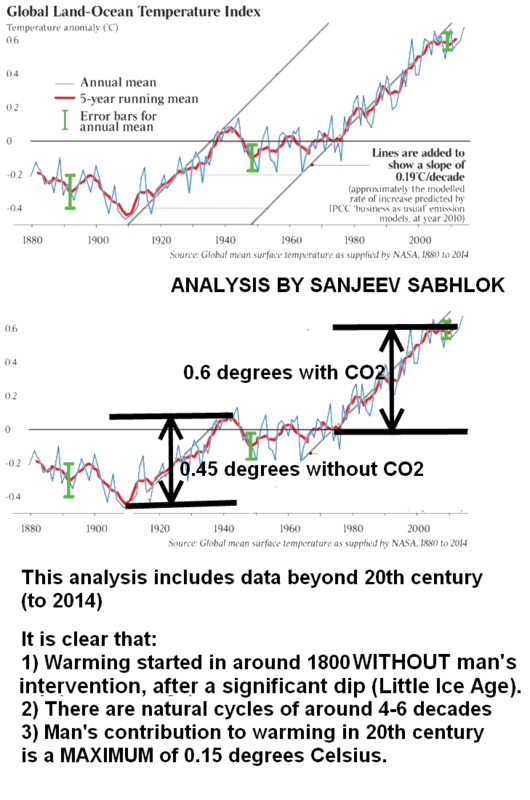 NOTE: It could be argued, based on the slope of the two rises, that there was no real effect of man's CO2 emissions. I'm willing to accept that as the most ikelyi case. However, for the sake of sheer prudence, the above analysis (shown in the second diagram below) can be considered. The MAX impact is therefore 0.15 degrees, with a most likely impact of zero degrees. At the request of someone who wanted me to provide proof that many scientists disagree with the climate change hoopla, I’ve compiled many of my blog posts on this topic. (also available on the right hand column of thig blog). The file is big (6MB) due to many diagrams. There remain many formatting issues in this booklet. As a result, my comments and those of others have got mixed up in the booklet and I don’t have time to fix this problem. I’d encourage anyone who wants to isolate my comments, to read the relevant original blog post/s by searching relevant terms in google, and restricting the search to site:sabhlokcity.com. Note that my blog posts cover perhaps less than 2 per cent of my readings on this subject, and therefore I have not commented on a HUGE amount of relevant material. I’ve also not commented on many professional economic issues such as precautionary principle on which I have done a fair amount of work offline (not in the public domain). DO READ BOTH SIDES OF THE STORY. And never believe me. Or anyone else. Never believe ANYONE BUT YOURSELF. Good luck in your search for the truth! I came across the release of this movie a few weeks ago but got to see it only now. It is very good. Its treatment of the science of climate change is excellent. Its treatment of the economics of cap and trade is not as great, though. [Indeed, its Australia section is actually incorrect.] It might have been best if the film was shortened by half to focus only on the science. The science discussed in the movie sets in perspective the facts about the climate which have been evident to me for some time now, but are not seen in the same perspective by the vast majority of Western "policy makers". I believe this is a typical Western trait, of total obedience to the "official" position. That's what explains Hitler. Or even the Soviet Union of Stalin. Hitler could never have succeeded in India. Someone would have pulled him down. Or shot him. Not so in the West. Like disciplined "soldiers", Western policy makers have put on blinkers (like horses) and refuse to ask questions since their "orders" have been received. I wait to see how long the West will be held to ransom by the IPCC. Anyway, here's the link to the HD movie (you can switch off HD if you don't have broadband). Watching this is particularly important if you have so far refused to ask questions and have taken the "official" position as gospel. I would encourage you to read up a lot after watching this movie. Be sure that you have the facts right. Then make up your own mind. Don't take my word on anything. Who is David Evans – this alleged anti-Semitic fraud and monster? John Quiggin asked me to not correspond further. So I wished him best of luck and left off. Now he seems to have changed his mind. He has sent the following email to me in relation to my blog post on David Evans's article. I find it odd that you send me the piece by Evans then say you don't care is he is a fraud or liar. In that respect, I'm compelled to say that Andrew Bolt is a bit more scrupulous. Here he is on the Galileo movement, whose anti-Semitic conspiracy theories are largely developed by Evans. I don't expect you to apologise to me or even retract your endorsement of the Evans piece you sent to me, but I want you to be fully informed of what you are doing when you promote this poison. First, do I care if someone is anti-Semitic? I'm quite happy to have even Hitler's views published. Not by me! But Mein Kampf should never be banned. Nor should anyone else's work. I'm AGAINST any ban on "hate speech". I've made that abundantly clear in the past on many occasions. I'm in favour of absolute freedom of expression – EXCEPT expression that directly threatens or expresses a plan of violence. But such plans of violence are not hate speech but acts of violence. Second, I was NOT "promoting" David Evans. I was discussing science. I've never even heard of David Evans before in my life. And if the Sydney Morning Herald can publish his work, then shouldn't it first be accused by John of "promoting" anti-Semitism or whatever? Note that David Evans didn't write to me to publish his post on my blog! He wrote to a proper newspaper. I merely cited his article. Third, in my blog post I was talking about DATA and EVIDENCE regarding the science of climate. It doesn't matter to human knowledge whether scientific information is published by an anti-Semite, anti-Christian, anti-Muslim, or by an anti-Hindu. Or anti-anything. I'm sure if you dig hard enough, you'll barely ever find any unbiased scientist. Or unbiased human. The key is to judge the science on its merit. The BALL must be played, not the PLAYER. John did not rebut any of the EVIDENCE that I discussed. He is once attacking the messenger. But I'm curious anyway, now. I don't have time to read the links sent by John (at least not today, when its is time to retire for the night). But if anyone knows who is this evil monster known as David Evans, please let me know. It may seem strange, but I've now got a feeling that anyone attacked by John (like Donna Laframboise) is likely to be an outstanding human being. For instance, there is NO JOURNALIST in the world who has investigated IPCC more thoroughly than Donna. She is the world's best investigative journalist. Or close to the world's best. Yet, John called her a liar (before he then retracted but called her analysis amateurish). Given John's track record, it is quite possible that David Evans will turn out to be a brilliant nice man. I have no interest in David Evans, but given John's charges, I might as well find out more. If he is anti-Semitic it won't change his science (or my opinion of his science), but at least I'll know that the science is being served to me by an evil man. I typed David Evans on google and found that he has published on ABC. That's pretty evil of them. Taxpayer funded, too. ABC. But it is time to retire for the night!